Ruby Green Smith (1878 - 1960) was born in Indiana and received her B.A. at Stanford University in 1902. She continued her studies and became a research instructor in Entomology and Bionomics, completing her M.A. in 1904. In 1908, Smith co-authored Inheritance in Silkworms with the famous Stanford biologist Vernon Kellogg, who studied evolution in insects. She then came to Ithaca, received her Ph.D. from Cornell in 1914, and promptly began a long and laudable career in extension. 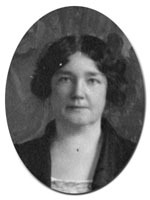 From 1919 to 1923, she moved from assistant to associate state leader of home demonstration agents, and finally became the state leader, as well as a professor in extension. She was at one time the assistant director of the Conservation Division of the New York State Food Commission and worked with the U.S. Department of Agriculture. Smith worked in extension until her retirement in 1944. In addition to writing a history of extension, she also started the Cayuga Bird Club, Ithaca Housewives' League, and Farmers' Market. Affectionately known as "Aunt Ruby" to most people in extension and in the College of Home Economics, Smith is best known as the author of the Home Bureau Creed, 500,000 copies of which were published and distributed nationwide. The creed reads as follows. This is the offer of the Home Bureau to the homemaker of today.